Today I found out Whitey Ford gave Pete Rose his “Charlie Hustle” nickname. 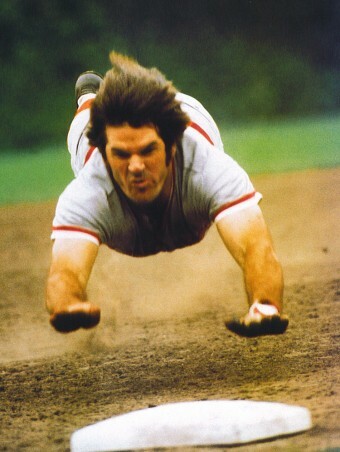 It was during spring training of what would turn out to be Pete Rose’s rookie year that Ford gave the nickname to him. The exact event that lead to the nickname is somewhat in dispute. The most commonly held story is that he gave Pete Rose the nickname after Rose drew a walk in a spring training game, but instead of jogging up the line, he sprinted. In any event, that hustle paid off as Rose went on to win the Rookie of the Year award that year, batting .272 with a .334 OBP while tallying 170 hits. From there, he went on to compile one of the most impressive “counting stat” careers in the history of the game, finishing his career as a player: first in hits (4256); first in games played (3562); first in runs scored by a switch hitter (2165); most doubles by a switch hitter (746); most singles (3215); most walks by a switch hitter (1566); most total bases by a switch hitter (5752); most consecutive seasons with 100 or more hits (23); and tied for most years with 200 hits (10, tied with Ichiro Suzuki who did it consecutively, unlike Rose, and just missed making it 11 straight in 2011 by 16 hits). In addition to those, Rose also added to his trophy case: three batting titles; one MVP; 17 All-Star game selections; and two Gold Glove awards. He also went on to manage, starting in 1984 while he was still a player and continuing on to 1989, with the latter three years of that as just a manager and not a player/manager. He eventually was placed on the permanently ineligible list in 1989 due to a gambling problem, including betting on Reds games, the team he was managing. In exchange for voluntarily being placed on that list, Major League Baseball agreed to not formally reveal their findings on his gambling habits. However, it is known that he bet on at least 52 Reds games between 1986 and 1987, though there was never any evidence that he bet against the Reds. Despite numerous appeals, Rose has remained on that list to date and is barred from the Hall of Fame because of it. Interestingly, Mickey Mantle was also once put on the permanently ineligible list for being associated with gambling. In his case, though, he wasn’t the one doing the gambling. Rather, he was working at a casino in Atlantic City in 1983 as a greeter and representative, primarily in golfing charity events. The commissioner of baseball, Bowie Kuhn, when he found out Mantle worked at the casino warned him that he would be banned from baseball if he didn’t quit. When Mantle ignored his warnings, the commissioner followed through on his threat and placed him on the permanently ineligible list. When Kuhn was replaced by Peter Ueberroth, Mantle was reinstated and allowed to participate in MLB activities again starting in 1985. Willie Mays was also placed on the “permanently” ineligible list at the same time as Mickey Mantle and for the same reason, working as a greeter and special assistant to the casino’s president. His suspension was also lifted at the same time as Mantle’s. After his rookie season, Pete Rose joined the US Army Reserves and served at Fort Knox for six months. He also served six years with the 478th Engineering Battalion at Fort Thomas as a cook. This division also included Johnny Bench, Bobby Tolan, and Darrel Chaney. Being a cook allowed him to only have to show up one weekend a month. During that weekend, he was also allowed to leave early so that he could make the Reds’ games. Rose’s first manager in the minor leagues once told the Reds that “Pete Rose can’t make a double play, can’t throw, can’t hit left handed, and can’t run.” A true testament to subjective scouting-style player evaluation. 😉 Further, he likely would have never even been signed at all out of high school had his uncle, who was a scout for the Reds, not begged them to sign him. Other scouts at the time reportedly saw little potential in him, but thanks to the fact that the Reds system was somewhat depleted at the time, they eventually agreed to sign him on June 18, 1960. Before 1991, Rose still would have been technically eligible for the Hall of Fame. It wasn’t until that year that the Hall voted to ban those on the permanently ineligible list, though it had been an unwritten rule previous to that among Hall of Fame voters. Pete Rose also holds the record for longest managerial suspension due to an on field event (30 days). This was following a confrontation between Rose and an umpire where Rose shoved the umpire after supposedly being scratched by the umpire on the face as they argued. Shortly after being banned from baseball, Rose was arrested and served five months in prison for failing to count horse racing winnings and money earned from selling autographs on his income taxes. The total amount he was deficient in back taxes was $366,041. Although officially banned from all MLB related events and activities, Rose was allowed to participate in the pre-game events before Game 2 of the 1999 World Series. The ban was lifted for a night because Rose had been selected by fans to the “All-Century” team. Pete Rose’s daughter Cara (stage name: Chea Courtney) starred in the first season of the soap opera “Passions” and had a recurring role in Melrose Place. Mickey Mantle was named after Hall of Fame catcher Mickey Cochrane as Mantle’s father thought “Mickey” was Cochrane’s first name. In fact, his name was Gordon. Due to an injury in college, Mantle nearly never had the chance to play professional baseball. During a football game, Mantle was kicked hard in the shin, which, aside from being really painful, the leg became severally infected and doctors initially thought they were going to have to amputate it. Mantle stated in his autobiography that his father forced him to marry the woman who ultimately became Mickey’s wife, Merlyn Johnson. While the two remained married until Mantle’s death, they separated fifteen years before and Mantle was known to have had numerous affairs. He even was audacious enough to bring one of his mistresses with him, along with his wife, to his Hall of Fame induction. Mantle also had a major alcohol problem through most of his life, as did pretty much everyone else in his immediate family. After having to have a liver transplant in 1995, Mantle stated to the press: “This is a role model. Don’t be like me.” Soon after that, he died of cancer. Edward Ford was given the nickname “Whitey” during his stint in the minor leagues due to his deeply blond hair. Once his career was over, Ford admitted that later in his career he had frequently cheated by doctoring baseballs. His favorite method was to mark up the ball using various sharp objects, such as his wedding ring. He also would have his catcher mark up the ball by sharpening a buckle on his shin guard and rubbing the ball against that before throwing it to Ford to pitch. Elston Howard, his catcher, also used the mud around the batter’s box to coat one side of the ball before giving it to Ford to throw. Mickey Mantle never went to college.